(Natural News) Have you ever noticed how many overweight people drink diet soda or add low calorie sweeteners to their tea and coffee? Corporate propaganda tells overweight and obese people who are trying hard to lose weight – or who at the very least are trying not to gain more weight – that artificial sweeteners are the healthiest possible option. Many obediently and diligently skip sugar, convinced that they are making the best choice. Unfortunately, several studies have confirmed that this simply is not true. The latest such study, conducted by researchers from George Washington University in Washington, D.C., and presented in March at the 100th annual meeting of the Endocrine Society in Chicago, Illinois, found a close link between the consumption of artificial sweeteners and metabolic syndrome. The group of conditions known as metabolic syndrome is diagnosed when a person exhibits insulin resistance, elevated “bad” cholesterol levels, high blood pressure, and an increased risk of blood clots. It is usually diagnosed in people who are overweight or obese and who carry a lot of weight around their bellies. Also known as dysmetabolic syndrome, insulin resistance syndrome or syndrome X, metabolic syndrome causes an elevated risk of cardiovascular disease, heart attacks and strokes. It also raises the risk of developing diabetes by between three and five times (300% to 500% relative risk increase). “Our stem cell-based studies indicate that low-calorie sweeteners promote additional fat accumulation within cells compared with cells not exposed to these substances, in a dose-dependent fashion — meaning that as the dose of sucralose is increased more cells showed increased fat droplet accumulation,” said Sabyasachi Sen, an associate professor of Medicine at George Washington University in Washington, D.C. “This most likely occurs by increasing glucose entry into cells through increased activity of genes called glucose transporters,” as reported by Science Daily. The research team exposed stem cells, which are cells that can change into bone, cartilage or mature fat cells, to a type of artificial sweetener called sucralose. These were then placed in petri dishes for 12 days in an environment that would promote obesity. At a 0.2-millimolar sucralose dose similar to the concentration found in the blood of people with high consumption of low-calorie sweeteners — equal to four cans of diet soda per day — the researchers said they observed increased expression of genes that are markers of fat production and inflammation. When the researchers studied human fat cells from the abdominal fat of 18 study participants who regularly consumed artificial sweeteners – four of whom were of normal weight while 14 were obese – they found similar genetic changes that caused increased sugar (glucose) transport into the cells of the obese participants. They also detected an overproduction of fat producing genes in these participants, though little change was detected in those who were at a healthy weight. 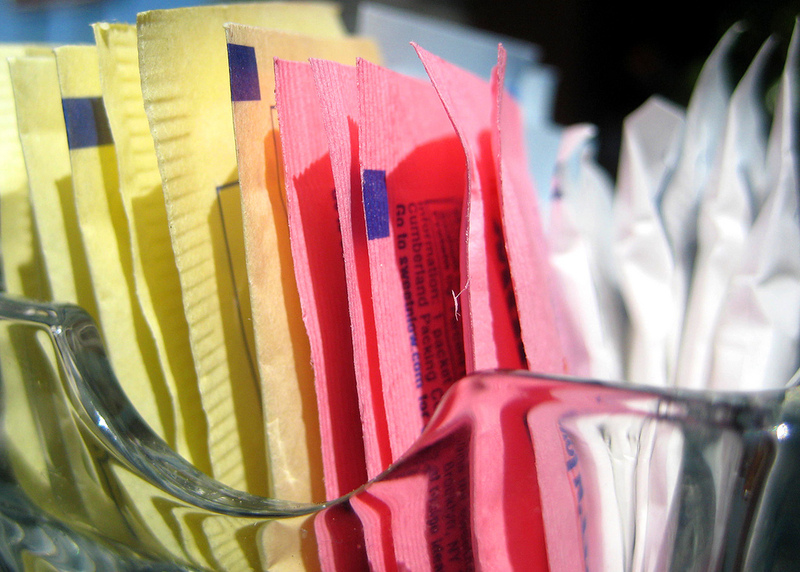 This is not the first study to link artificial sweeteners to an increased risk of diabetes. Back in 2016, researchers from the Weizmann Institute of Science in Israel found the same link when exposing mice to water spiked with saccharin, aspartame or sucralose for 11 weeks. Mice had “abnormally high glucose levels in their blood after eating.” This glucose metabolism spike happened in just five weeks and is considered the hallmark of diabetes. Saccharin (a.k.a. Sweet’N Low) was the quickest contributor to high blood glucose levels, so the researchers zeroed in on it. Also, it appears to have the same effect, regardless of whether the mice were lean or overweight.